On Monday, 23 May 2016 the Smile Breakfast presenters, Bobby Brown and Lindy Hibbard took on the challenge to raise 9040 beds for The Haven Night Shelter PBO by Friday, 27 May 2016. 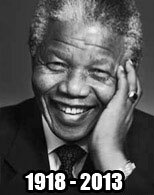 To do this, they needed each listener to participate in the challenge to donate R12 to help a less fortunate person to participate in The Haven’s rehabilitation program. The Haven Night Shelter which has 15 shelters throughout the Western Cape provides their residents with a rehabilitation program to integrate them back into their communities, providing each with food, shelter and the necessary social services required. The Smile 90.4FM team is overwhelmed by the support shown towards this charity drive, listener contributions not only in two days broke 2 targets set by the Breakfast team (initial of 9040 beds and a second on Tuesday of 20 000 beds), on-air during Smile Breakfast on Wednesday, listeners decided that the campaign should continue until Friday with a target of 50 000 beds. On Friday, 27 May 2016 the Breakfast presenters, Bobby Brown and Lindy Hibbard showed an act of empathy in recognition of the homeless and broadcasted live from an outdoor location on the N1 Incoming at the coldest time of the day. Hassan Khan, Director from The Haven Night Shelter invited the Breakfast team to share their final hour of the show at the shelter in District Six in the run up to the on-air announcement of the final donation. Just before 9am, Smile Breakfast announced that listeners did not only break their own target of 50 000 beds but exceeded the original target of 9040 beds by more than 50 000 beds. 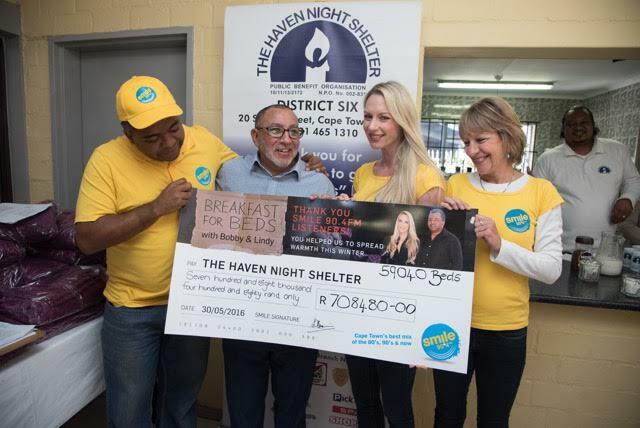 Lois O’ Brien, Managing Director of Smile 90.4FM, together with Smile Breakfast presenters, Bobby Brown and Lindy Hibbard handed over a provisional cheque to The Haven Night Shelter Director, Hassan Khan for 59 040 beds equating to R 708 480. Due to the donations which keep coming in, Smile 90.4FM has decided to keep the donation line open till Friday, 03 June 2016. A final audited donation will then be handed over to The Haven Night Shelter to wrap up their Breakfast for Beds campaign.